The wonderful YouTube user Nocturnaloner (who created the gorgeous Halloween animation "Kingdom of Witches" that I posted about HERE during last year's countdown) has crafting another beautiful video for the Halloween season! 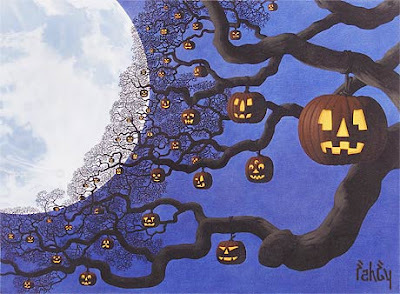 The animation uses words from Ray Bradbury's immortal book The Halloween Tree, is inspired by a painting of William Fahey of the same name and is accompanied by the score to the opening sequence of The Halloween Tree cartoon. ::Swoon:: What could be more Halloween-y? Behold, I give you "The Halloween Tree"!